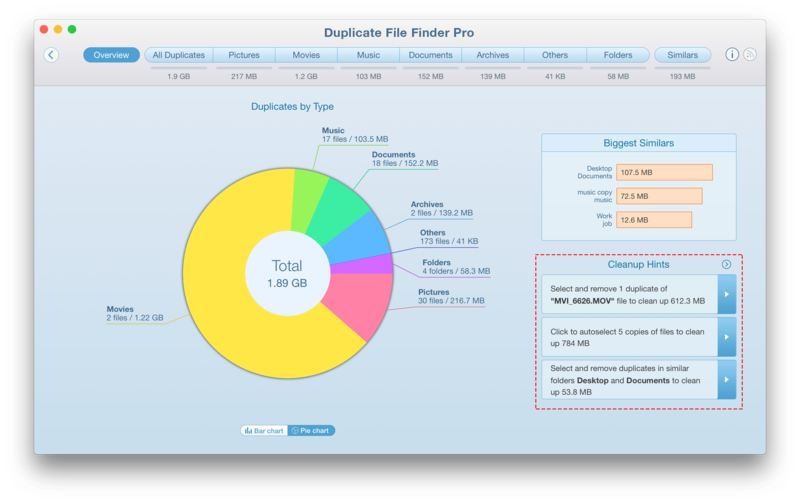 Duplicate File Finder provides a Cleanup Hints option for better user experience – for example, to remove the largest duplicates, remove duplicates in Similar folders, and remove duplicates that have the most copies. You can find them in the Overview tab. They show which files are better to remove to free up as much disk space as possible quickly and easily. There are three hints at a time. Each time you click the Pointer button, you get new tips. On the screenshot below, you can see three types of tips for a fast and deep cleanup. If you want to use the hint*, click it and you will automatically be switched to the appropriate section which has suggested items that have already been selected. Preview the details and confirm removal. 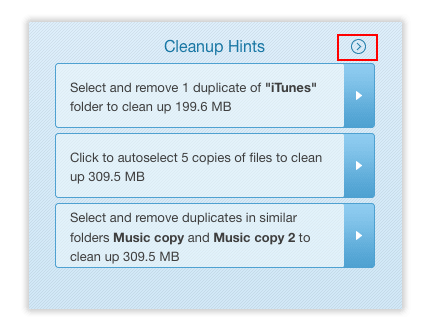 *Note, the use of CleanUp Hints is available in the Pro mode only.